Intervene Immune is dedicated to reversing a process called “thymic involution” in people. Here is why. The thymus is the master gland of immunity. It is largely responsible, by educating bone marrow-derived cells to become the T cells that carry out cellular immune functions, for protecting you from foreign invaders such as bacteria and viruses, and it is also responsible for attacking tumors. B cells, which are not educated by the thymus, are responsible for “humoral immunity,” which is mediated by antibodies. T cells, however, “talk to” B cells and regulate their function, so the thymus has powerful control over most immune functions. 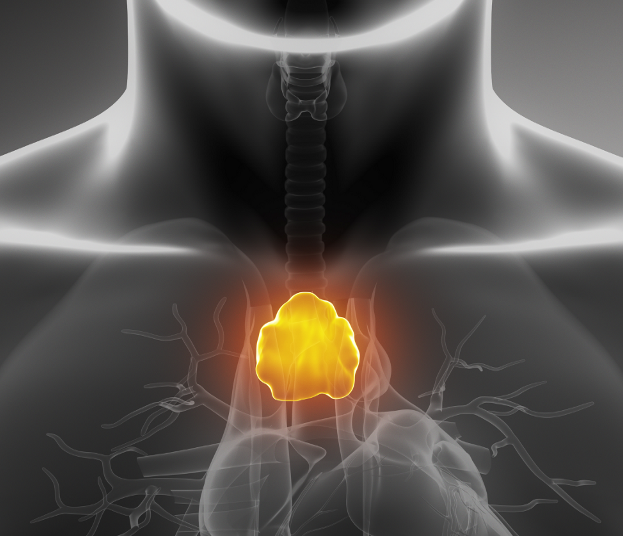 The thymus undergoes an apparently programmed process of atrophy called involution, particularly around the time of puberty, both shrinking and gradually being replaced by fat. This results, finally, in a massive and fairly abrupt collapse of immune system competence sometime between the ages of 65 and 75. Unfortunately, impaired immune system competence is strongly associated with a greatly increased risk of death in humans, both when it happens at younger ages (as in AIDS patients or after irradiation prior to bone marrow transplantation) and when it happens as a result of getting older following thymic involution in youth. What this means is that, if thymic involution is not corrected, you will eventually die from it, if nothing else kills you first. We believe thymic involution is a major but under-recognized limiting factor for human longevity and health maintenance into old age today, contributing to, for example, the fact that 90% of all flu-related deaths happen in people over the age of 65. We intend to change this. We believe thymic involution is reversible using techniques that are available today. To prove this, we have instituted a human clinical trial, the TRIIM trial, to reverse thymic involution in 50-65 year-old normal healthy men. The TRIIM trial is described in more detail at this project page, where you can learn more about it and also make a contribution to help support expansion of the trial.